Private lessons are one-on-one, 1 hour classes, between the student and the teacher. Semi Private lessons are two students to one teacher, ideal for brothers and sisters or friends who are of a similar level. * 3 students or more are considered to be a group lesson. Private & semi private lessons are for all ages from young learners through to adults and elderly students. The lessons are designed to suit the students specific requests, and to cover particular areas of desired study. Conversation and brush-up English classes, business English, improving reading and writing, preparing for English tests or travel abroad are all popular reasons to take private/semi private lessons. Taking a private/semi private lesson allows you receive the complete focus of the teacher, and therefore work together to recognize areas which need improvement, in particular pronunciation, comprehension and using correct grammar. Please contact G&S to discuss scheduling a time and day for your lesson. Private lessons can take place during all G&S working hours, upon agreement with the student and teachers schedule. This class is ideal for children to come and learn the basics of English through play, music & movements,workbook time, group reading and craft. 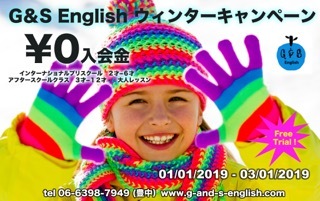 This class has a ‘club’ environment and accepts all ages of children and all English speaking levels. The class is 2 hours, there is also the option to extend your class for a further 2 hours (4 hours total) which will include lunch time and trips to the park or swimming (in summer). A class for Mum and child to learn English together. Through play, music, flashcards and some simple crafts English is encouraged at this very early stage. It is a good chance for your child to become acquainted with a school environment and spend some time with a foreign national teacher.